Why Doesn't Warren Buffett Pay His Investors a Dividend? Buffett loves dividend stocks, so why doesn't his own company pay one? Warren Buffett has said several times that an increasing dividend is an extremely attractive feature when evaluating a potential stock investment. And, if you take a look at Berkshire Hathaway's (NYSE:BRK-A) (NYSE:BRK-B) stock portfolio, you'll notice that it's full of some of the best dividend-paying stocks in the market. However, Berkshire doesn't distribute any of this income to its own shareholders as a dividend, a fact that many people find odd. In his 2012 letter to shareholders, Buffett decided to give a thorough explanation about why Berkshire doesn't pay a dividend, and after hearing it, it might just make you rethink your whole idea of why you buy dividend stocks. How can we make our subsidiaries more efficient? Can we expand the geographic reach of any of our businesses? Can we widen the economic moat that separates our businesses from their competitors? So, like most other companies, the first priority is to take care of the current business first. Even the highest-paying dividend stocks generally don't pay out much more than 50% of their profits as dividends -- smart managers know that you have to spend money to keep your competitive advantages, and Buffett is no exception. Here's where Berkshire starts to differentiate itself from other companies. After meeting the needs of all of its current subsidiaries, there are typically billions of dollars in cash left over. With this excess, Berkshire's second priority is to search for acquisitions (which presumably includes new stocks to buy as well). As Buffett explained, his acquisition test is simple: Will the acquisition leave shareholders with more intrinsic value after it's completed? Berkshire paid $1.3 billion for its 15.6% stake in American Express, which is now worth more than $10.5 billion, a 719% gain. Coca-Cola, perhaps Berkshire's most well-known stock investment, has produced a return of more than 1,200%. For a recent example, Berkshire's $5 billion investment in Bank of America in 2011 is worth about $9.6 billion as of this writing, a gain of 93% (14% annualized). The point is that it's hard to make a case that Berkshire should have given that $5 billion to shareholders instead of investing in Bank of America, and the same can be said about the majority of Berkshire's investments over the years. What if there are no attractive acquisitions available? Buffett's third favorite use of capital is share repurchases, but only if certain criteria are met. Specifically, Berkshire will only repurchase shares when management feels that they trade for a meaningful discount to their intrinsic value, which Buffett currently defines as 120% of book value. As he says, "It's hard to go wrong when you're buying dollar bills for 80 cents or less." And Berkshire has proven that when shares are cheap, it will pounce on the opportunity. If shares are above this threshold -- which, as you can see from the chart below, they usually are -- Berkshire's fourth priority with its cash seems to be doing nothing at all. Buffett prefers to keep an 11-figure cash reserve at all times, and is perfectly content adding to it if he feels like there's no compelling use of excess capital at the time -- after all, there will be eventually. History has proven so time and again. As you can see, dividends aren't even on the list of priorities for Berkshire's profits, even though Buffett acknowledges that shareholders may need income from their investments. There's a pretty good reason for this, which Buffett calls his "sell-off strategy," an alternative that often works out better for investors. Basically, he says that if you want, say, a 3% dividend, you should simply sell 3% of your shares each year. By doing so, you'll achieve the same income goal while positioning yourself better than if the company has simply paid you a dividend. In fact, this is the strategy he uses to give his money to charity -- he simply donates a little more than 4% of his shares each year. Without going into a lengthy and complicated mathematical explanation, here's why this approach works out better than a dividend. Essentially, since you can sell your shares at a substantial premium to their book value (as you can see in the chart above), you're actually getting more than they're worth -- someone is essentially paying you $1.38 on the dollar for your shares (as of this writing). Meanwhile, since the company has invested its profits instead of paying a dividend, the intrinsic value of your remaining shares will theoretically continue to grow at a rapid pace. This is why even though Buffett gave away nearly 26% of his shares in the seven years prior to this explanation, the book value of his stake increased by more than 42% during the same time period. Additionally, the sell-off approach often has tax advantages as well. While the full amount of a dividend will be taxed, just the profit portion of a sale is subject to tax. For this reason, the sell-off strategy is almost always more favorable from a tax perspective. 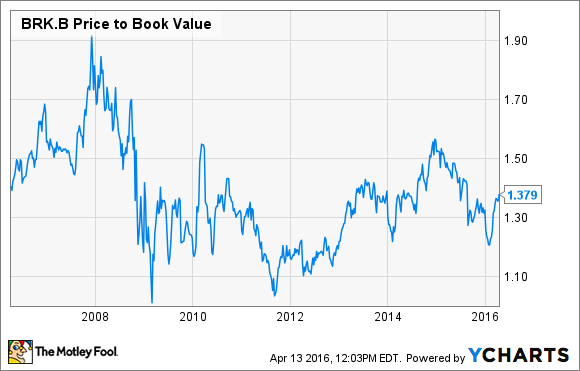 Will Berkshire ever pay a dividend? Buffett didn't go so far to say that Berkshire will never pay a dividend -- just that it won't as long as the company's book value continues to build at an acceptable rate and the shares continue to trade for a premium. If either factor changes, he has made it clear that the company will reevaluate its strategy. However, I wouldn't expect that to happen anytime soon.